This book offers a new interpretation of political reform in the settler colonies of Britain's empire in the early nineteenth century. It examines the influence of Scottish Presbyterian dissenting churches and their political values. 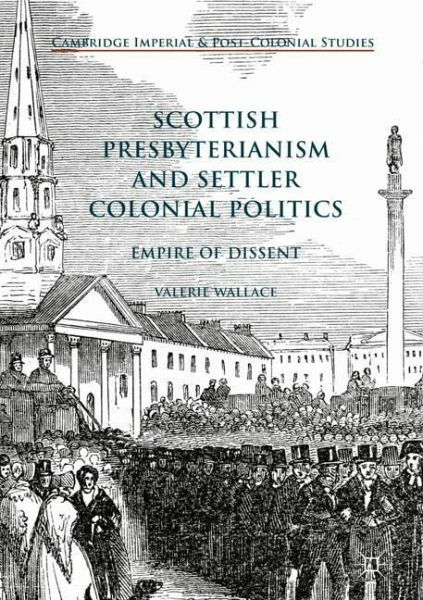 It re-evaluates five notorious Scottish reformers and unpacks the Presbyterian foundation to their political ideas: Thomas Pringle (1789-1834), a poet in Cape Town; Thomas McCulloch (1776-1843), an educator in Pictou; John Dunmore Lang (1799-1878), a church minister in Sydney; William Lyon Mackenzie (1795-1861), a rebel in Toronto; and Samuel McDonald Martin (1805?-1848), a journalist in Auckland. The book weaves the five migrants' stories together for the first time and demonstrates how the campaigns they led came to be intertwined. The book will appeal to historians of Scotland, Britain, Canada, Australia, New Zealand, South Africa, the British Empire and the Scottish diaspora. Valerie Wallace is a Lecturer in History at Victoria University of Wellington in Aotearoa/New Zealand. In 2011 she was the inaugural US-UK Fulbright Commission Scottish Studies Scholar. Before that she was a researcher at the Bentham Project, University College London. 1: Introduction: Empire of Dissent. 2: Thomas Pringle in Cape Town. 3: Thomas McCulloch in Pictou. 4: John Dunmore Lang in Sydney. 5: William Lyon Mackenzie in Toronto. 9: Disruption at the Cape. 10: Republicanism in New South Wales. 11: Samuel McDonald Martin and Oppositional Politics in Auckland.